When the Star Wars wave hit in the late 1970's, science fiction rode that crest back to the major media in a major way. Battlestar Galactica and Buck Rogers in the 25th Century took most of the TV sci-fi glory, but one of the more unique shows to emerge during this time was The Man From Atlantis. Unlike its interstellar competitors, this show went into the undersea kingdom to find sci-fi magic. As a result, it became a cult sensation and produced a major new star in the process. The saga of The Man From Atlantis began when a mysterious man washed ashore on a beach. He was rushed to a hospital, where he was discovered by scientist Dr. Elizabeth Merrill. As she nursed him back to health, she noticed he was possessed of superhuman abilities, including great strength, acute senses, and the ability to swim at great depths without any breathing equipment. It was soon revealed that this mystery man was Mark Harris, the last survivor of the mythical undersea kingdom of Atlantis, which somebody should’ve clued into based on his webbed hands and feet and the fact that he had gills instead of lungs. After realizing the Atlantean’s tremendous abilities, Dr. Merrill asked Mark to join her team of scientists at the Foundation For Oceanic Research on a project to learn more about undersea life. Mark agreed, and the group set out to in a special submarine known as the ‘Getacean’ to carry out their research. No good work comes off without a hitch, however, and the man from Atlantis had hitches galore. First, those water-breathing gills may have been handy down in the deep, but they only allowed him to stay on dry land for twelve hours before he had to return to the sea. Secondly, there were all the interloping surface-dwellers. Chief among these was C.W. Crawford, the bottom line-obsessed director of the Foundation, but there was also plenty of interlopance from other, less scrupulous scientists like the nefarious Mr. Schubert and his assistant Brent. A typical The Man From Atlantis episode combined science fiction, action and underwater thrills into an exciting package. Plotlines often included paranormal elements, including a creature whose touch caused humans to revert to a childlike state and an episode in which the crew discovered a portal to another dimension. The end result was a memorable show that briefly inspired its own tie-in comic book from Marvel Comics. The Man From Atlantis only ran on NBC for one season, but it did manage to rack up quite a few fans during this time. It was especially popular in the People’s Republic of China, where it enjoyed the distinction of being the first American program purchased for broadcast in that country. The show also produced a major star in Patrick Duffy, who quickly graduated to a long-standing role as Bobby Ewing on the hit prime time soap Dallas. 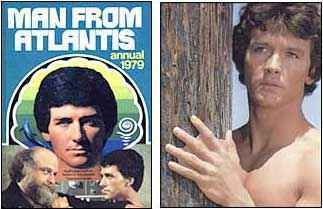 Today, The Man From Atlantis periodically returns in reruns, always finding an enthusiastic audience of sci-fi fanatics and lovers of retro TV.